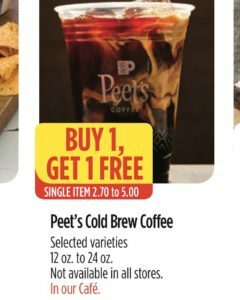 Buy One Get One Free Peet’s Cold Brew at Raley’s and Bel Air Through August 7! Buy One Get One Free Peet’s Cold Brew! Only at Raley’s and Bel Air that have a Peet’s coffee inside! Where to Use Your $2 Off Finish Coupons! September 20 is National String Cheese Day!!! Grab Some For $.99 at Safeway! $5 Friday at Safeway!! Stock Up Time on Pillsbury!